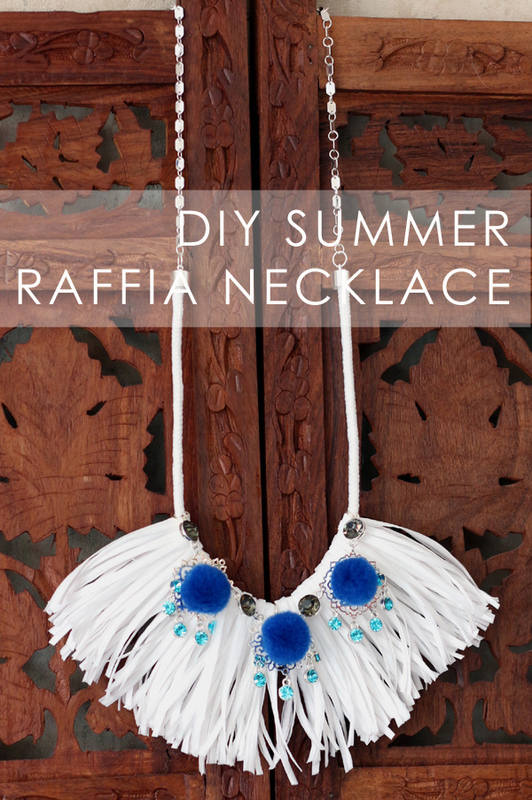 This DIY necklace combines four trends into one piece of jewelry: raffia, rope, pom poms and rhinestones. 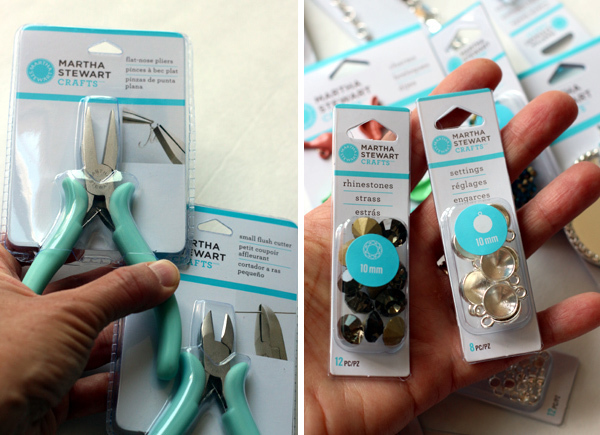 You can make it using components from the new line Martha Stewart Jewelry and a few inexpensive additional supplies. As reported earlier, high-end designers are all over pom poms and raffia this spring. Tory Burch and Dolce & Gabbana knock offs are everywhere from Anthropologie to H&M. 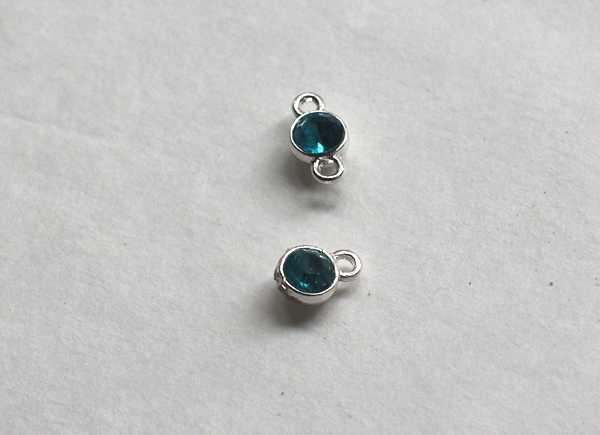 Why settle for a $60 knock-off when you can DIY your own custom jewelry. Here is some of Martha's new stuff - tools, rhinestones, settings, beads, enamels, glazes and epoxy clay. I hope to play with the clay and custom molds in a future project. Martha Stewart Jewelry is available only at Michaels. I'm not much of one for tiny crafty things, and the sight of a whole box of weensy rhinestones, beads and charms put me in a cold sweat. I could imagine Martha tut-tutting over my shoulder as I flipped an entire container of little gems onto the carpet. About 12 hours later, I came up with this. Cut a 16-inch piece of rope. Cut the raffia into pieces about six inches long. Bend in half. Apply glue and glue to rope. 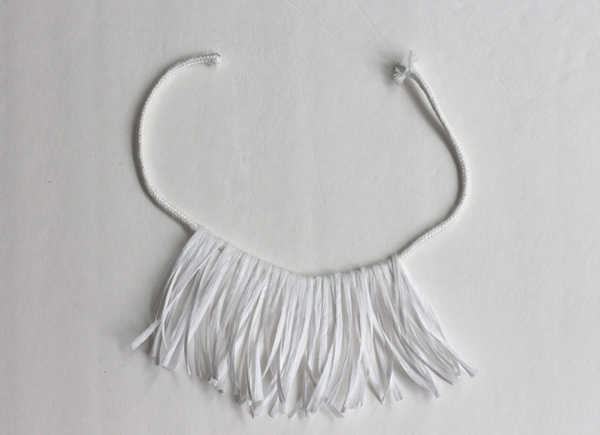 Go back and forth over a 5-inch section, layering raffia until you get a nice thick necklace base. Use up the whole spool (60 feet in my case.) This will take forever. Glue the four large rhinestones into settings with two loops. Using small jump rings (I made my own with jewelry wire. This also will take forever. This is Martha. We did not say it would be easy, only that it would be fabulous.) 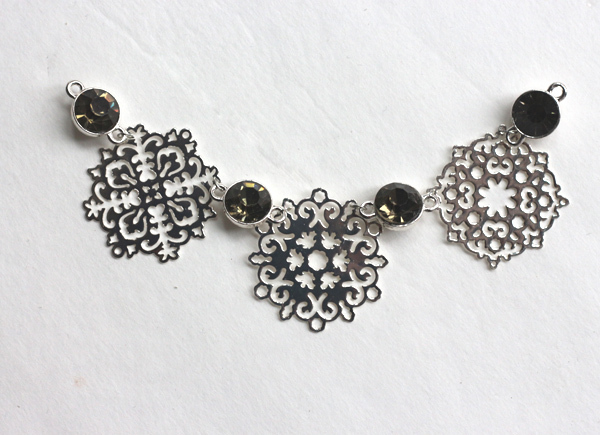 attach the rhinestones to the filigree as seen above. Glue the small rhinestones into their settings. You won't have enough single loop settings in one package for the next step, so either cut off loops from some of the double loop settings or buy more than one package. Above you see a double loop setting and a cut-off single loop setting. Sand down any rough spots. 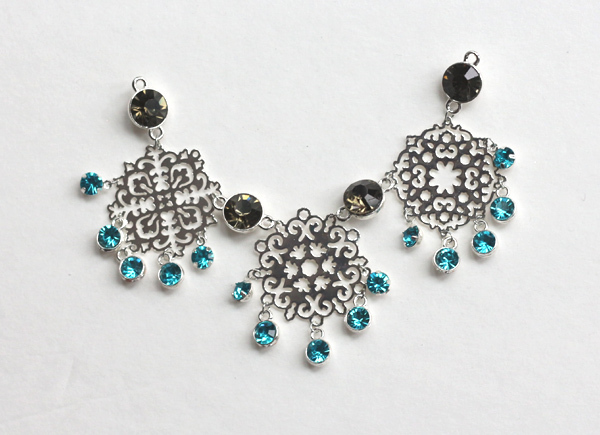 Attach the 15 smaller rhinestones as show, five per filigree. You will be hating life right about now. Hard part is over. 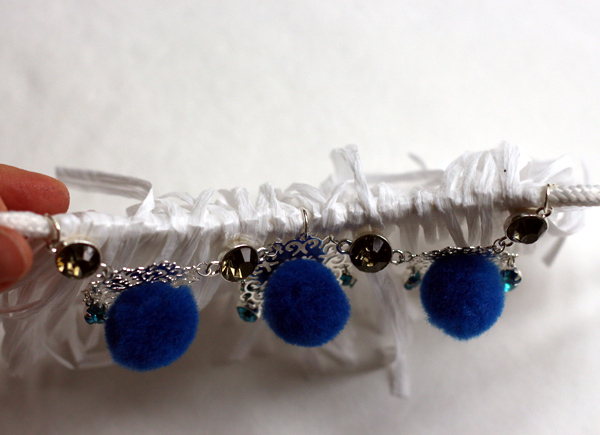 Glue pom poms to the filigree. Now use three large jump rings to attach the components to the rope as seen above and below. Glue on two end caps. Add two large jump rings and add chain. Add another jump ring and lobster clasp to the top of the necklace. The whole thing looks like this. 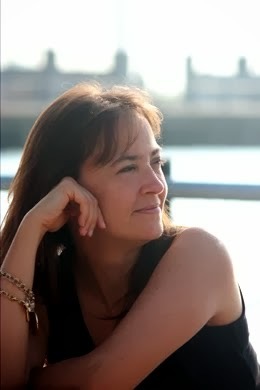 You can wear it full length or shorten it up to be more of a bib or collar necklace. This is my first totally self-designed jewelry not made from something weird like jump rope or a tin can. The products aren't quick to use by any means but when you are done you feel like you really created something. 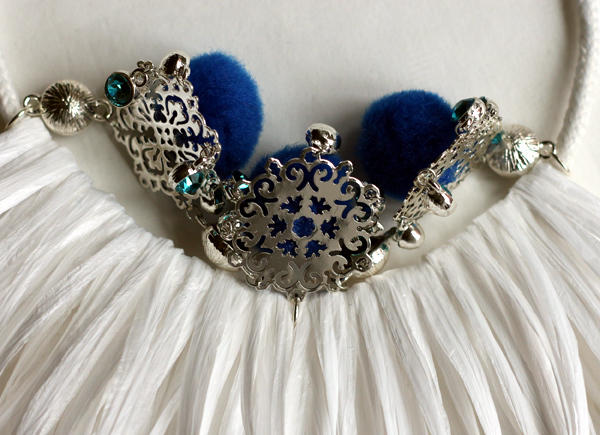 If I had more filigree, I would have made this a five pom pom necklace (and might still do so). 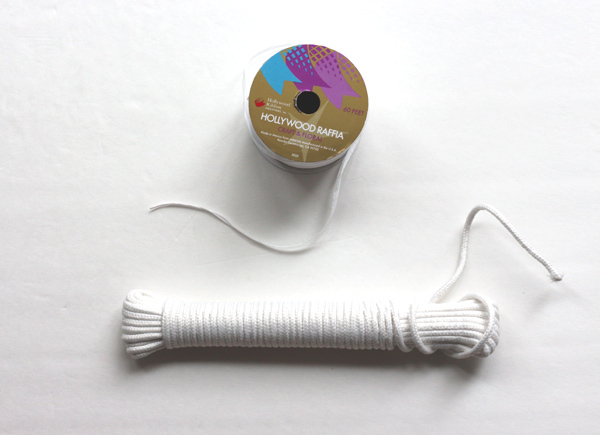 Disclosure: Plaid Crafts provided me with the products and reimbursed me for trying them. The project and opinions are my own. This is one of the most original projects I've seen coming out of this line. I really love the raffia-- it's something I've wanted to use too-- and it definitely amps things up beyond the basic martha supplies! Thanks! That means a lot coming from the queen of DIY jewelry. Aw, shucks. Any recs on where to buy raffia on the cheap in NYC? I'm back for the weekend! I can tell you the art store in Metro Tech area is out. (WC Art & Drafting). I ended up ordering it online from Hobby Lobby with free shipping and 40 percent off deal. Ooh, fun that you were reimbursed for playing with this line. I agree with Erin: looks highly original. I was hoping you'd be making some necklaces after seeing your pins as of late. Love what you made. 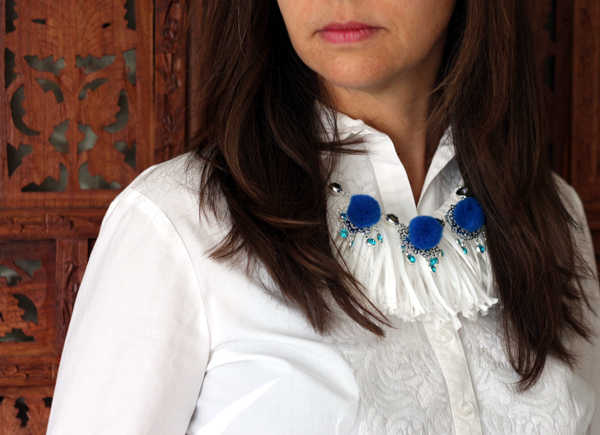 Are there more necklace DIYs on the way? Show us more! Workin' on it, workin' on it.